The attorneys at Brennan Burtker LLC have extensive experience representing large corporations and small businesses in complex commercial disputes and labor and employment actions. We have represented companies as both Plaintiffs and Defendants in state and federal courts in actions involving breach of sales and services contracts, fraudulent transactions, breach of employment contracts, violations of the Fair Labor Standards Act, violations of the Illinois Wage Payment and Collection Act, violations of the Sales Representative Act, failure to pay wages and overtime, breach of non-disclosure and non-compete agreements, and misappropriation of trade secrets, as well as class actions, employment discrimination actions and claims brought before the Equal Employment Opportunity Commission. Our attorneys understand that litigation is an unwanted, but sometimes necessary part of maintaining a thriving and successful business. We take a pragmatic and practical approach to each case and aggressively advocate for our clients in order to obtain efficient and optimal results. While we strive to obtain quick and cost-effective resolutions for our clients so that they can continue to focus on their businesses, we recognize that there are times when parties simply cannot reach an amicable resolution. 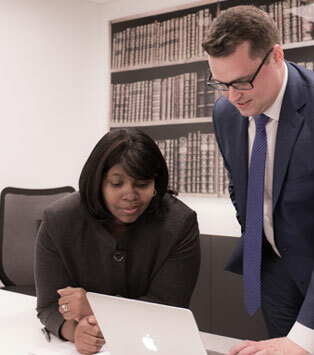 As experienced trial attorneys, we are always prepared to see any case through to verdict to fully protect the rights and interests of our clients.